We’re big fans of the $1 specialty bakery-quality bread loaves you can buy at Walmart. The bread has a short shelf life, but that just encourages you to get creative in how you use the bread to ensure you make the most out of that $1. On a recent Sunday morning, Matthew used slices of a French bread loaf and just a few ingredients to whip up a quick and fancy breakfast. Here’s how he made his own variation of French toast for two, using the ingredients from a simple Food Network recipe. Step one: Preheat your stovetop burner on medium heat. Step two: Thoroughly mix your eggs, vanilla, cinnamon sugar and milk in a bowl. Step three: Coat your bread slices in the sweet egg mixture. Step four: Lightly butter (or oil) your pan and place your first two slices of coated bread into the pan. Step five: Turn your French toast slices once, then repeat the process for the remainder of your bread. Step six: Cut each French toast slice of bread in half and arrange as you like on a plate. With the ingredients in this recipe, you will have four half-slices each for two plates. Step seven: Crush a few pecan halves with your hands and sprinkle on the French toast slices. Step eight: Sprinkle your desired amount of brown and powdered sugars onto your French toast. Step nine: Serve with the desired amount of syrup. Matthew’s Take: When I’m cooking for people, I like to deliver a beautiful presentation when possible. There’s so much you can do to make French toast look beautiful. Powdered sugar and pecans (or any kind of nuts or fruit) can make your dish look like something you would get in a restaurant. This recipe is my take on a Food Network basic French toast formula. I added the pecans and sugar topping, but the original recipe suggests the perfect ratio of eggs, milk, cinnamon sugar and vanilla extract. You can take that basic provision and then top the toast with your favorite ingredients. I give this French toast an A+ for presentation, an A for taste and a B for cost-effectiveness. You can make French toast very cheap, with only bread, milk, eggs and a cinnamon and/or sugar ingredient. The pecans, multiple sugars and vanilla are extras that add taste, while also adding a few more ingredients and dollars to that grocery bill. The only reason I didn’t give this recipe an A+ on taste is that I used a French bread loaf that had “everything” seasoning topping on it and, although I brushed the topping off, a slight hint of flavor remained on a few slices of the bread. I would suggest using plain French bread, but I used the loaf we had in our pantry. 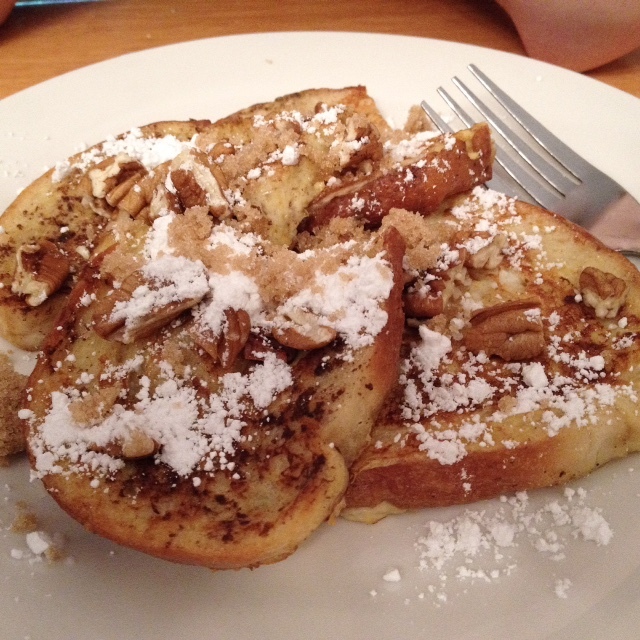 Molly’s Take: How do I love this French toast – let me count the ways! Not only is it fluffy, soft and deliciously moist, this French toast is covered in tasty toppings that enhance its hearty, pancake-y exterior. Now, you have to know me to know how absolutely crazy it is that I like this dish. I have a bad history with French toast (a church camp experience in which I was forced to play dizzy dodgeball in the summer heat after eating a ton of it along with chocolate milk=bad idea), and I generally dislike pancakes. Yes, I dislike – and have even used the term hate – pancakes. But since Matthew and I have been together, I’ve developed a more open mind toward them. On a recent trip, I even ate them twice! This breakfast dish reminded me of pancakes, but was so much more hearty and nowhere near as mushy as pancakes can be. It was like perfectly fluffy pancakes with a soft, yet firm, sugar-dusted exterior. Altogether, if I gave this dish a grade, it would definitely be A+.